Concerns that a tree might fall and damage your property, or even worse, hurt a person, are definitely serious. Tree hazards are also a liability. If your tree, or one of its limbs, damages someone else’s property or hurts another person that could easily result in a costly lawsuit. Whether you’re worried, or you just want to be sure, the last thing you want to do is neglect it and assume everything is okay. You want to follow through on having your tree inspected and determined if it is really dangerous or if some of the issues you’re noticing aren’t true causes for concern. Spotting a problem early, and getting a professional on your property for a tree inspection, can reduce your chances of having a serious issue. Even when you’re in doubt about a potential problem with your tree, it’s always best to err on the side of caution when it comes to something this important. Here are 7 tree hazards to watch for in the trees on your property. 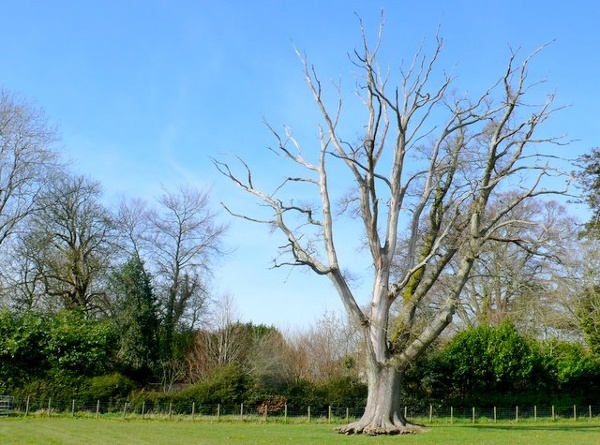 Probably the most visible (and most obvious) of the tree hazards, a broken or hanging limb is a telltale sign that your tree is, in fact, a danger. However, limb damage isn’t always so obvious. A professional tree removal firm will look for splits and cracks to determine how severe the damage is. It’s not just hanging or damaged limbs that pose a fall risk. Limbs in your tree may be dead without you even realizing it and these can eventually fall as well. Included bark, or “ingrown bark tissues,” can develop where two or more stems grow closer together. When this occurs, it can create a “V” formation and be more likely to split or break (as opposed to a more normal “U” formation that a professional would look for). If you have a tree that is leaning, a professional will take into account a number of factors, the most of important of which, is how long has it been leaning. Has it been this way for a long time or is this a new change? And, does it continue to change? Is it leaning more today than it was last week? Tree roots are sometimes unknowingly damaged during construction activities. But problems may not actually manifest until years, even decades, later. That means damage to a tree in your yard could have been done before you even lived there. Clearing trees during the construction phase can also cause problems for the remaining trees on the property. For instance, if the lot is wooded, and parts of those woods were cleared, the remaining trees (that may have once been situated in the middle of the woods) are now right on the edge of the construction line. Those trees previously had a windbreak when the other trees were there. Now that they are exposed, they are more susceptible to wind damage. In a forest, trees compete for the sunlight and grow very tall without quite so many branches. However, outside of its natural habitat, a tree in your backyard typically develops a wide crown with a lot of large lower branches and limbs. Unfortunately, an overburdened canopy and a significant amount of large limbs can structurally weaken the tree over time. Over the years Greg and his crew at Case Mountain Tree Service have completed several extensive and small projects at our home in Manchester. I’ve always found his work to be reasonable priced and accomplished with the high standards you would expect from a professional. I hold Greg’s company in high regard. A great value! I would like to thank Greg Best for being there for me to remove the trees around the house and back yard over a 10 year period. I’ve had trees removed that would have caused a lot of damage if they fell on my house. I use Greg to do the job and always have been satisfied. Thanks Case Mountain Tree Service! Greg did and amazing job cutting down 8 large pines on my property. He was fast. Look no further! He’s got my business every time. Great job at a very reasonable price. These guys are very personable and professional! Case Mountain Tree Service was on time and did great work at 18-20 Chalmers St. I will gladly recommend Greg to my friends for other jobs. Case Mountain Tree Service took down three large trees next to my house and limbed another hanging over it. They did a great job and I highly recommend them, and I have! I have used Case Mountain Tree Service for over 10 years now, and have found Greg Best to be honest, reliable, reasonable and completely trustworthy! I would, without hesitation recommend this company.